Black Omen appear in the sky in all time zone. You begin this chapter after confronting Magus in 12,000 B.C., with the option to let him join your party. It takes place anytime from when you're first able to fly anywhere you wish with the Epoch, and until you rescue Crono. At this point, you can do any number of sidequests listed in The Fated Hour, but this chapter is written with the assumption that you'll spend your time saving Crono first. If this is your first time through the game, you'll almost certainly want to complete the quest to save Crono before doing anything else, and if this is a New Game + you won't need the equipment that the other sidequests offer since you'll have them already. So I'll assume you're just going to proceed with getting Crono back. To save Chrono; You'll start out in 12,000 B.C. If you visit the Commons after obtaining Magus, Alfador the cat will abandon the child he normally chases and will meow at Magus and follow him around. Remember what Janus said "Don't waste your time, Alfador only likes me." Cute. The Nu will also sell some new items in the center hut. Take to the skies in the Epoch, and you'll see the Ocean Palace rise into the sky, it will show up in all future time periods from this point on. For more details, see the next chapter. Head to the "End of Time" to talk to old man Gaspar (The Guru Of Time). One of 2 Gates to Lost Sanctum. 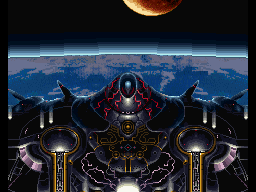 On DS after the Black Omen appears in the sky, two Gates will appear, which leads to Lost Sanctum, one in 65M B.C. near the Sun Shrine and one in 600 A.D. near Ozzie's Fort. Incidentally, Gaspar will have a special bit of dialogue talking to his old pupil if you talk to him with Magus in the party and without Marle. Either way, he'll play a song, "memories of Crono." As you begin to exit the area he will offer you a Time Egg, or a Chrono Trigger, which gives you the chance to alter history. Gaspar will tell tell you to visit Belthasar. Also, talk to everyone at the End of Time if you want to get their reactions to Crono being gone, and challenge Spekkio if you want. Keep in mind the form you fight depends upon the level of the character in the lead of your party, which you can now select. If you do not already have a Clone of Chrono, head to 1000 A.D. with the Epoch (fly around and hit to change time periods) and compete for a clone of Crono at Bekkler's lab in Millinial Fair. He will let you do this even though you normally would need Crono in your party. You can pick up the Clone at Crono's house once he has one. Once you have the Clone, use the Epoch to fly to the Keeper's Dome and talk to the Nu (aka Belthasar) there. Belthasar will have one final program to execute to help you climb Death Peak and then ask you to let the Nu sleep. Head just north of the dome to find Death Peak. There are three main "challenges" to climbing Death Peak, during each of which you will be assisted a Poyozo doll. The first section is dominated by fast-blowing winds which can knock your character out of the area. Hold down and race to the first Poyozo Doll, then rest behind the tree. Grab a Power Tab to the right of the tree, and race forward when the wind dies down and walk steadily behind a tree to hold your place when it blows quickly. After passing by a second tree, you'll be in another area. Fight a few enemies, grab a Magic Ring, then move to a new area with a Wall Ring and a save point. If you go inside the cave nearby you'll have to fight a Lavos Spawn. Lavos Spawn Needle. : hits all party members for 100-300 damage. Status affliction attack: single target, looks like a red "Dark Bomb". Deals ~40-100 damage and a random affliction. The trick to fighting these guys is to only attack the head, never the shell unless you want to be hit by a Lavos needle. You'll need to avoid all techniques which attack multiple targets or rely on physical attacks. Besides the Lavos needle, the head will just use a few annoying status affecting spells, just take your time and heal if necessary. You can also charm a Elixir off the Head. Move the shell to this position and climb it. Pick up Giga Arm, a weapon for Robo, cross a cliff, and pick up BraveSword, another weapon for Frog as you keep moving. Use the blinking blue dot to open up a passage in the rock cliff, and backtrack around and go through the cave you opened. Pick up the StarScythe and fight the Krakker that falls; continue north through the door. After another battle with a Lavos spawn, you'll meet the second Poyozo doll which will just advise you not to fall off. My advice when crossing the bridge with the wind blowing on you is to hold up the whole time to hold your position, and press to run only when you need to move up. Head into the next area where Krakkers keep falling from the cliff, pick up a VedicBlade, and head south. Crono, now back among the living. You'll meet the third poyozo doll and backtrack above the area you walked around earlier, make sure you head down a ladder to reach a save point and pick up a Dark Helm, which cuts shadow hits in half for the guys/frog/and robot. The third doll said to "push the shell, climb the shell", so after fighting a third Lavos spawn push its shell so the top of it roughly lines up with the ladder in the cliff, and climb it. Grab the Memory Cap off to the right on the ledge behind the tree. 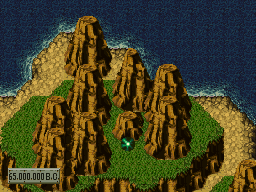 The next area will be a clear one at the summit of Death Peak, and you'll attempt to rescue Crono. Magus has some interesting reactions to the time freeze which takes place, and Marle naturally a vested interest in getting Crono back. And as usual each member of your party has a few unique things to say if you bring them along. Anyway, you'll travel to the instant before Crono died and freeze time so that you can exchange the Clone for Crono's body right before he was destroyed by Lavos. Your party members will be glad to have him back, and you'll be ready to confront Lavos and finish off the final quests Chrono Trigger has to offer. 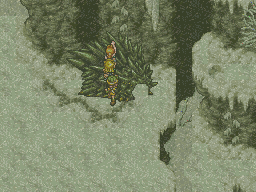 If you challenge Lavos during this chapter (While you have the Epoch flying but before you rescue Crono), you'll get The Reunion Ending. There are several variations depending on whether or not you crashed the Epoch into Lavos, spared Magus, and whether or not you got the clone or the time egg. 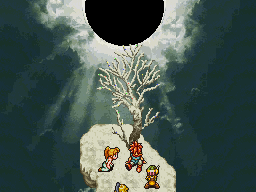 The basic theme of the ending is that Marle and company go back to rescue Crono at Death Peak since you didn't do it yourself. This page was last edited on 24 April 2018, at 01:17. This page has been accessed 179,562 times.